All Are Precious In His Sight: Boss Your Heart Bible Challenge 2011, Plus a Giveaway! 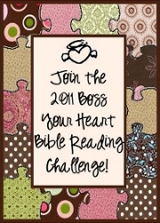 Boss Your Heart Bible Challenge 2011, Plus a Giveaway! "Boss Your Heart" into a New You! Boss Your Heart Bible Challenge for 2011! If you aren't familiar with Chrissie's "Boss Your Heart" story, please click HERE to read about it. Chrissie bossed her heart and taught many people around the world the importance of bossing their hearts, too. But, if we don't know what God's Word says, we could boss our hearts down a very dangerous path! In order to boss our hearts into submission/alignment with where God wants our hearts to be, we must know what His Word says. The Bible says our hearts are deceptive; therefore, it is imperative that we hide His Word in our hearts. God has designed our hearts with a hole in them that can only be filled by Him, and by reading His Word daily, we will begin to truly know Him, to know His Word, to understand His will, to fill the void that's intended to be filled by our loving Father. As we devote daily time to reading His Word, we will begin bossing our hearts in Chrissie fashion, into submission with our Father's Word and His sovereign will. The challenge begins January 1, 2011. There are lots of ways to join this challenge, and lots of ways to successfully complete this Bible-reading mission! And several more plans to choose from, just click HERE! YouVersion (the source for the plans listed above) also has a Facebook page. Click HERE to "like" it! Here's another source where you can sign up to read the Bible in a year, have them email you a daily assignment (love that! ), plus choose what style you'd like from classic to chronological and a few other varities. Bible Gateway is another online source for accessing the Bible in almost every language! A lot of Bibles have a one-year reading plan as well, so you might prefer to pick up your Bible and follow the reading plan that it offers. And, of course, let's not forget about the precious leadership of the Holy Spirit! Perhaps the Spirit's been whispering a plan to you to lead you through God's Word through 2011! Dive in! I've started a Facebook group for those who would like to "sign up" there to join the Facebook Boss Your Heart Bible Challenge 2011 group! Just click HERE to join the Facebook group! Leave a comment here (on this post) to let me know you're joining the Boss Your Heart Bible Challenge 2011! Encourage others to join the Boss Your Heart Bible reading challenge by sharing this on your blog/facebook/twitter/email, etc. You'll get 1 entry for each method you share! (Tell me how many times you shared it by leaving a comment on this post.) Let's work together to invite people around the world to "Boss Their Hearts" in 2011!!! and a "Boss Your Heart" New You! To get one of the following buttons, copy and paste the code into a blog post or into an blog sidebar gadget (pick an "HTML gadget" on Blogger) or widget (pick a "text widget" on Wordpress).